A group of camp instructors are preparing to reopen a campsite where a young boy drowned some years ago. But a masked killed is there, waiting to kill them. It is actually very disappointing. I discovered it only recently, and in spite of the popularity, it did not enchant me. Indeed, the story is basic with a killer who takes his revenge of what happened to him when he was young, or at least it’s what we believe till the end of the movie! This end surprised me, which is a positive aspect of the movie, because I really believed that Jason had returned. It brings a twist in the drama, but is not the most original choice for a killer comeback. The overall movie is quite predictable, and the good characters irritating: they’re just really dumb and take bad decisions throughout the night. It’s a pity that the deaths are not brilliant, because it would have added a bonus to the movie. The scenes of slaughter are short and typical of basic slasher movies, with no innovative ideas (e.g. killing a half-naked girl in the bathroom, we’ve seen that already!). Then again, it’s a 1980’s movie, so it might have been original then. 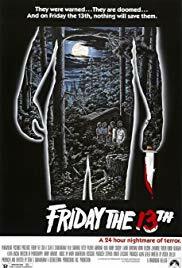 Still, Friday the 13th is an entertaining must-see film, and my disappointment will not stop me watching the sequels.